I just stumbled on a fascinating new interview with Kim Stanley Robinson, speaking on Earth Day about Sixty Days and Counting. The interview is on the Planetary Society's Planetary Radio show and is available here as an MP3 download. The Planetary Radio archives are a great resource, with a lot of fascinating space and astronomy-related interviews and radio features. A president who installs solar power at the White House and drives in a motorcade of lightly armored Toyota Prius hybrids. A president who has a blog that he actually writes himself (with millions of comments, of course). A president who promises that the US will work closely with other countries through the UN to solve climate problems - and who really means it! A president who actually takes science seriously. It's just too bad that Phil Chase is a fictional character, otherwise he would definitely have my vote. Real candidates: please read this book! I'm learning a lot of interesting things and really enjoying the final volume of Kim Stanley Robinson's "Science in the Capital" series, Sixty Days and Counting. Abrupt climate change has hit the world hard in this series (as it is about to do in real life), and science and politics have to join forces to save the world. There's a lot going on in our characters' lives - some of it rather weird and not that plausible, but I've gotten to like most of the characters in this long three-volume novel, and I'm willing to suspend my disbelief. I'll let you know if we make it. The title is from a Lucinda Williams song, but I'm referring to a cool web site that simulates collisions between two galaxies. While searching for more interactive astronomy web stuff for the Cub Scouts (and myself! 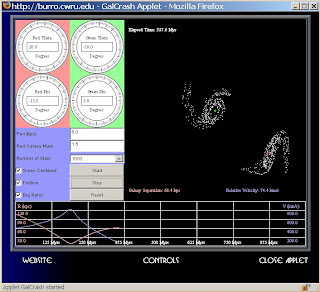 ), I found Galaxy Crash, a hypnotic little Java applet by Chris Mihos (Case Western Reserve University) and several colleagues. You can set relative mass, closest approach distance, number of stars, and some orientation parameters relative to the orbital plane. Severe time acceleration allows hundreds of millions of years to pass in mere seconds. Although quite zippy in the simulation, these are soft, slow collisions - the stars in each galaxy are so far apart that they rarely collide - the galaxies pass through one another, and all the distortion that we see is caused by everything pulling on everything else gravitationally. Here's an unrelated animation that shows a two-galaxy collision in 3D (by Jeff Bryant). And here's a real example from Hubble. Stephen Hawking isn't exactly the "father of black holes," though he is the scientist most people would probably think of when you mention black holes or cosmology (if they can think of any scientist at all). Hawking is probably the best known scientist since Albert Einstein, who also has a claim on paternity for black holes, and Hawking now also has a new claim to fame, since becoming this week the first disabled person to experience a zero-G flight (in an aircraft - he's hoping to make it to space in the next few years). Go Dr. Hawking! Hawking isn't doing this just for the thrill of it (not that this wouldn't be a good enough reason). He's pushing hard for the idea of space as a backup plan for Earth, a favorite idea of many space advocates (myself included). Before his zero-G flight he was quoted as saying, "Many people have asked me why I am taking this flight. I am doing it for many reasons. First of all, I believe that life on Earth is at an ever increasing risk of being wiped out by a disaster such as sudden global warming, nuclear war, a genetically engineered virus, or other dangers. I think the human race has no future if it doesn't go into space. I therefore want to encourage public interest in space." Right on, Dr. Hawking! In honor of Dr. Hawking, and because I have to find some web-based activities for a group of Cub Scouts who will be rained out of looking through telescopes tomorrow night at an astronomy event, I found a really cool interactive activity to learn about black holes. 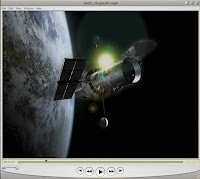 This is a Flash-based activity at Hubblesite.org called Journey to a Black Hole. The interactive steps and animations on the journey give you an idea of the great distances involved in getting to either Cygnus X-1 (8100 light-years) or to the center of the Andromeda Galaxy (2.5 million light-years) to get up close and personal with a black hole. The site also includes a Black Hole Encyclopedia with great graphics and explanations, as well as direct links to some Flash-based black hole experiments. Cool! 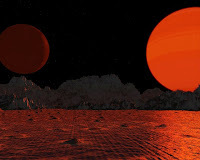 I was searching to find if anyone has yet done an impression of what the surface of the newly discovered exoplanet Gliese 581c might look like with its red dwarf sun. I didn't find that exactly, but I discovered a really cool collection of planetary landscapes created by Jeff Bryant using Vistapro software. The one shown here (with Jeff's permission) is titled "Red Dwarf" and it was done (apparently) before this week's announcement. I'm sure someone will use the estimated dimensions of the Gliese system to do a more specific surface-viewpoint rendering sometime soon, but I like this one a lot. I got to work early this morning and had time to take a good walk. I'm lucky that this office park borders a protected land area with extensive jogging and nature trails - very cool. I can walk just a few minutes and not even hear any cars. Not that I would since I always walk with my iPod, but it was great to see so many signs of life emerging in the spring woods, while hearing a frantic Indian tabla piece, followed by John Lennon singing "I'm so tired," followed by Joni Mitchell's sweet dulcimer and voice on "A Case of You" (with James Taylor's distinctive acoustic guitar fills ringing in my left ear). Technology, music, and nature merge. Nice. Sublime, almost. And much farther afield, the news is full of possible signs of life - a still somewhat massive (5 times Earth mass, the smallest exoplanet yet found) but seemingly Earth-like planet orbiting within the "habitable zone" of a red dwarf star some 20 light years away. No actual signs of life yet, but calculations suggest a temperature range where water is liquid, a good start. And the cover of the new Scientific American declares "Hazy hints of Alien Life: Does methane point to bacteria on Mars and Titan?" Maybe! The article is not yet on-line, but a technical article on the Mars methane by author Sushil Atreya is here (1 MB PDF). Carnival of Space is Up! The first Carnival of Space is up today. 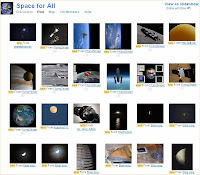 Although most of the referenced postings are at blogs whose main theme is space, it's also cool to find some space-related posts from people who don't consider space their main thing (are these the closet space geeks?). Lots of interesting reading and unexplored blogs to discover (or rediscover). Thanks Henry! Pretty crazy to think that both my youngest daughter and the Hubble Space Telescope turn 17 this year. Today is the 17th anniversary of Hubble's launch and deployment, and it's really incredible how much this amazing instrument has taught us about our universe. 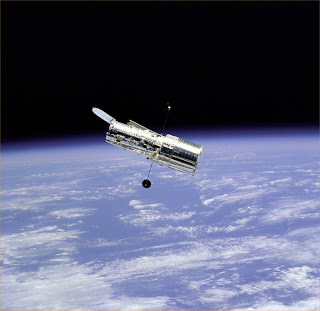 Even after 100,000 orbits and 500,000 images, Hubble is still going strong (despite a few aches and pains that the next astronaut servicing mission will fix). My daughter has a few more months before her 17th (and of course she's amazing too). 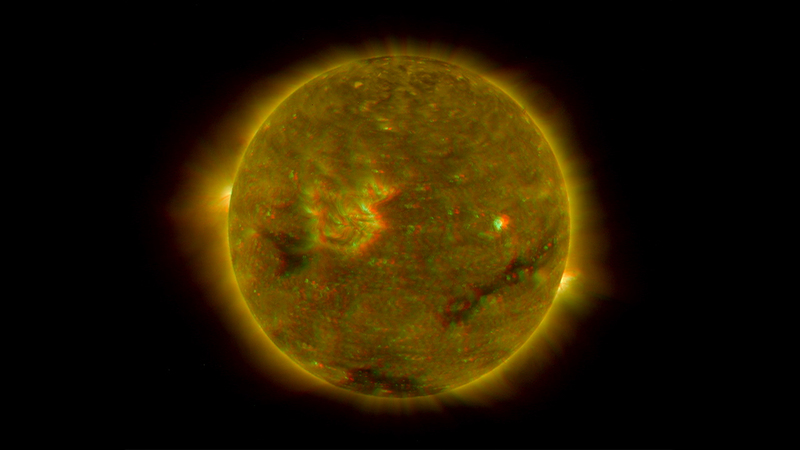 This is really wild - the first direct three-dimensional images of the sun taken by NASA's Solar TErrestrial RElations Observatory (STEREO) satellites. Get out your red/cyan 3D glasses and check them out. Although it ended in March, I just discovered the Space Settlement Calendar Art Contest that was sponsored by NSS. 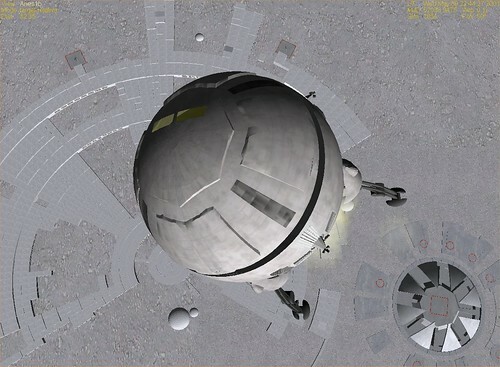 The picture above is NOT one of the entries - it's a screen shot of an orbital space settlement modeled in Orbiter, the Stanford Torus (several other pictures on Flickr). While Orbiter can make some pretty nice images (considering that it's a real-time space flight simulator generating many frames per second), artists can produce spectacular images, and many of the entries in this contest are indeed spectacular, especially the grand prize winner, Return to Abalakin by Alexander Pruess. 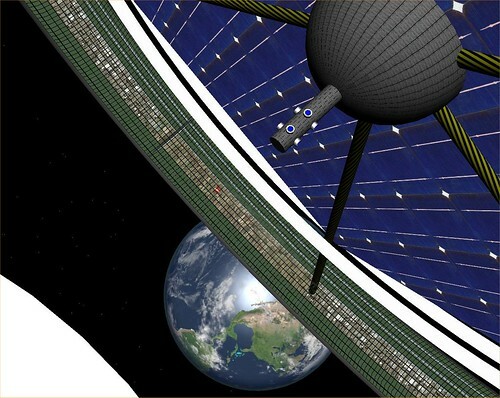 His image is a realistic, highly detailed, and beautiful internal view of a Stanford-like space settlement. I would have loved to show the image itself, but it's copyrighted and all, so I better not - hence the Orbiter image as a placeholder for the space settlement idea. Check out the gallery. I'm looking forward to hearing more about the contest and buying one of the calendars next month at ISDC in Dallas. I learned about this through Jim Plaxco's Artsnova blog. Jim is active in NSS and headed the contest committee. He is also a JPL Solar System Ambassador in the Chicago area. It's a fantastic spring weekend here in New England, and in honor of Earth Day, I should go for a nice long walk - and so I will. But first I decided to post a few new screen shots of the Earth from Orbiter. The high-resolution (level 10) Earth textures are really quite good. 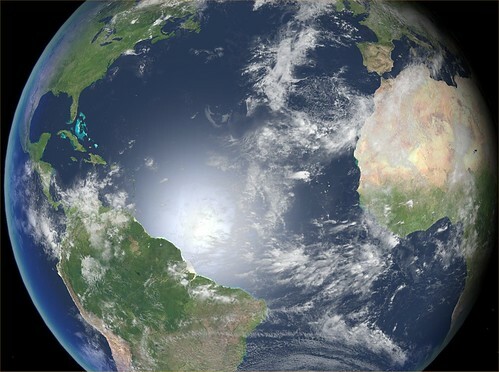 Of course there is no shortage of real space views taken by astronauts available on the web (the clickable map on this NASA site is really nice). MSNBC has a cool slide show presenting photos of the Earth taken from the Gemini period (mid-sixties) to the present. You can launch it from this page, which includes a number of comments about the Earth by astronauts who have actually seen it from the perspective that most of us only dream about (or simulate). More pictures on Flickr. Was it an asteroid? A nuclear war? A huge volcano? The author never says what caused the lingering winter which blocks most of the sun's light and covers everything with ash - even the snow is gray. Nothing grows, and the few remaining human survivors wander the barren land searching for anything that will keep them alive a little longer. It's grim and dark in more ways than one. Although I'm not obsessed with post-apocalyptic fiction, I have read a number of books in this genre over the years. While we hope and work to avoid the end of life as we know it, it is interesting to think about what it would be like, and about the survivors and how they would cope. Some of the best I've read include Riddley Walker, The Wild Shore, and Oryx and Crake. I now have to add Cormac McCarthy's The Road to that list. This book was on many "best of" lists for 2006, and was recently added as a rather unusual selection for Oprah's Book Club. It's not really so much a science fiction novel as it is a story of parental love and devotion, and of decency amid horror. The descriptions of the destroyed Earth are amazingly realistic - you can see and even taste and smell this world. As scary and sad as it is, the book is wonderfully written and is a compelling page turner - I finished it in two evenings. There's not really any connection to space in this book, except in one scene where the boy and his father are discussing whether there still might be people alive in other places. He asks about Mars. The father says, if you had a really good spaceship and people to help you, maybe you could go. The boy asks, would there be food and stuff when you got there, and the father says, no, there's nothing there. Maybe we could change that part. There are serious amateur astronomers, and then there are serious amateur astronomers. Alan Chu is apparently one of the latter. Based in Hong Kong (which I don't imagine ever has the best seeing or sky transparency in the world), he has some great images of Mars on his "workshop" web page. But his masterpiece is a free 225-page PDF called Photographic Moon Book (version 3.1). The book is a detailed photographic "tour" of the Moon, with over 250 original Moon images (extensively labeled), excellent diagrams and explanations, and detailed notes on observation and imaging techniques. This is clearly a labor of love, and also a work of great beauty and quality. It is also a huge download - 100 MB! I learned about it in an email newsletter from NSS, which references this U.S. mirror site, which has given a "403 Forbidden" error all day today, perhaps due to traffic. So I went directly to Alan Chu's own Hong Kong-based web page, and the download took about 3 hours! I’ve read a number of articles in recent days about how the space race in Asia is heating up. Japan will launch its Moon-orbiting SELENE probe in August. India has an active space program. South Korea is building a rocket launch site. And China’s program is the most extensive of all in Asia, including human spaceflight (two orbital missions so far, with the next one planned for 2008). 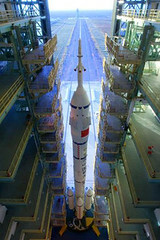 China seems to view its space program as a serious matter of national power, prestige, and technological leadership. According to this report from a recent visitor to China (thanks to Brian Dunbar for the tip), China is very serious indeed about the Moon – according to SciGuy's guest blogger, they plan to get Chinese astronauts there within 10 years, and to “not make the mistake” that the U.S. did, i.e., they will establish a permanent Moon base. If that should actually come to pass, it will certainly be well ahead of NASA's plans for the Moon, and while the immediate economic value of a Moon base may be questioned, its message of technological and territorial leadership would certainly be clear. The picture of the Chinese LM-2F "Long March" booster above is from the Flickr pages of Kodiakspace, a fellow Orbiter user who has collected a number of photos and other images from Chinese space missions and plans, in addition to images of his Orbiter add-ons and adventures. In the wake of tragic events like Monday's murderous rampage at Virginia Tech, superimposed on the "background noise" of daily murderous rampages in Iraq (183 dead just today), it's sometimes hard to remain hopeful about the future. We've got nature on the run. We've got each other on the run. Where do you find reason for optimism? I just finished Kim Stanley Robinson's Fifty Degrees Below, in which climate has changed rapidly and catastrophically. It's pretty bad, and it's only part two, so the effects of scientifically based efforts to restart the Gulf Stream and to capture carbon more efficiently are not resolved (I've got the third volume on hand). But it's a most hopeful disaster novel - when push comes to shove, human beings can cooperate, and reason can (mostly) prevail. There are no super-heros and no miracles. Complex problems require complex solutions. But life is worth preserving, and that's worth remembering and participating in, whenever possible. Another good point is a TED speech by author Robert Wright that I watched tonight. This guy is no polyanna, but the title of the talk is "How cooperation (eventually) trumps conflict." There is progress, moral progress, not only technological. It's not a zero-sum game. So there is hope. I hope. N.B. The TED web site has been redesigned and it is much easier to find the TEDtalks videos now. There are a lot of great things out there, all of them around 17 to 23 minutes in length. I also watched excellent talks tonight by E.O. Wilson and Sir Martin Rees. These are also "scary but hopeful" talks and well worth watching. Henry Cate is organizing a blog carnival for space-related blogs. The first Carnival of Space will launch on Henry's Why Homeschool blog on April 26, with plans to run it weekly. Blog carnivals are cool - it will be great to see a space one! Thanks Henry. This three-minute video has apparently been on YouTube for a while, but I just saw it (thanks again, Jim!). Pretty realistic visual effects. If there would be enough time to (mostly) clear the 405 freeway on a stretch long enough to land an airliner, it seems there would have to be enough time to clear a runway at nearby LAX or an Orange County airport for an emergency landing, but hey, you've got to suspend your disbelief for these things, you know? The New "Quiet is the New Loud"
"Quiet is the new loud" is the title of a 2001 CD by the Kings of Convenience (the Norwegian duo of Erlend Oye and Eirik Glambek Boe). I discovered this CD a few years ago, and it's still one of my favorites. What appeals to me is their good songwriting combined with a certain magical blend in their two-part harmonies. There are some combinations of voices that just work, creating a sound that doesn't really sound like either of the separate voices. This ethereal blend is not the only thing I listen for in music, but when it happens, it's something special, and it certainly catches my ear. The Beatles sometimes achieved this (though of course they were masters of many sounds), as did CSNY (especially Crosby & Nash - their 3 and 4 part harmonies are smooth too, but it's not the same thing). Simon & Garfunkel probably achieved the most perfect blend (to my ears) on many of their songs - the Bookends album especially comes to mind. I just discovered an oddly-named duo that has some of the two-part magic as well as excellent songs. 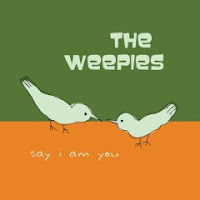 I downloaded "Say I am you" by the Weepies (songwriters Steve Tannen and Deb Talan), and although their female/male two-part is perhaps not as sustained and bell-like as S&G or the Kings, it pleases my ears, puts me in that same quietly mellow mood, and just sounds right. This is so cool: small submarines with neutral buoyancy that literally fly through the water. Graham Hawkes has designed and built many of the small submersible vehicles used in undersea film making and exploration. His company (Hawkes Ocean Technologies) has extended this with "hydrobatic" vehicles and they have even offered a "flight school" for people wishing to become underwater pilots (only two classes so far, in 2003 and 2004, next one planned for late 2007-2008). There aren't many of these vehicles around yet, so the demand for pilots is perhaps a bit low right now. H.O.T. 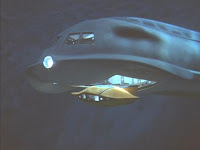 has built several prototypes and is seeking funding to build "Deep Flight II" which will be capable of dives to 36,000 FSW (feet of seawater), to the bottom of the Mariana's Trench! Although I'm actually not much of a water person, as a kid I had a fantasy of building a personal submarine, designed around parts I could have ordered from the Sears catalog, which in the sixties carried a wider range of products than today. My mini-sub was based on a propane tank, various hardware, and a number of items from the boating section. It never made it off the drawing board, but it left me with a latent fascination for subs in general. As I think back now, the TV show Voyage to the Bottom of the Sea (1964-68) also played a pretty big part in this fantasy! In addition to the Seaview "mother ship," that show also featured a pretty nifty flying sub. I found this (the real flying sub, not the old TV one) through a Flickr user and blogger (Steve Jurvetson) who does and photographs a lot of cool stuff. Some of his photos are in the Computer Simulations pool. Take a look at Steve's faves, rocketry pix, and adventures. I think I want his life. At tonight's meeting of the Aldrich Astronomical Society, we watched a wonderful ESA video called "Hubble: 15 Years of Discovery." It was downloaded in segments by one of our members and I think the total time was about one hour. The graphics and explanations are really fantastic, and it doesn't assume you are an astronomy expert. In fact it's an excellent introduction to the current facts and issues of astronomy, many of which are current facts and issues thanks to the images and data returned by HST. The nine segments of this video are available on YouTube (chapter 1 is here, and you can find links to the other chapters on the same page), and that would obviously be the quickest way to see them. But to really appreciate the quality of the graphics in this documentary, I'd suggest downloading the MP4 files from this page. These are big files (we watched the H.264 MPEG-4 versions on a video projector and the quality was excellent, total of 1.3 GB) but worth it if you have the bandwidth and disc space for them. There's also a DVD available here. I've been using Flickr for quite a while as a place to store and display my gallery of Orbiter screen shots (and a few actual photos) for blogging. Flickr is also one of those Web 2.0 net-social things you hear about, though I haven't paid much attention to that aspect. Then yesterday I noticed a comment on one of my pictures inviting me to submit it to the Flickr group Space for All, so I joined the group and submitted a few shots to the pool. There are many astronomical photos, NASA images, photos from museums, and even a few other simulation images from Orbiter and Celestia. Some really excellent stuff - it's a nice way to view the "best of" images created or selected by a number of people with space and astronomy interests. I also joined the Computer Simulations group and submitted a few Orbiter shots. It's a more eclectic (and currently smaller) group with flight simulator pix, 3D modeling examples, and a few from Celestia as well. What sort of a "space blogger" would I be if I failed to even mention Yuri's Night! Yuri Gagarin became the first human to orbit the Earth on April 12, 1961, and now that date is celebrated by space enthusiasts everywhere. I'm planning a pretty quiet Yuri's Night myself - perhaps I'll install and launch a Russian spacecraft in Orbiter and take it for a simulated spin around the globe. "So it goes" was a recurring phrase used in the novel Slaughterhouse-Five whenever death or other transitions or unexplainable things occurred. I heard on the news this morning that Kurt Vonnegut, Jr. died yesterday. So it goes. Vonnegut was 84 and died of complications from a fall, ironic in a way since he was a lifelong smoker, and he referred to smoking as a "classy way to commit suicide." In my college days (early 70's), I was a huge fan of Vonnegut's writing. I loved his dark humor, his irreverant and skeptical take on just about everything, and his humanity. Favorite books included Slaughterhouse-Five, The Sirens of Titan, Cat's Cradle, and even Slapstick, though that was not regarded (even by him) as one of his better efforts. In recent years I started to re-read a few of his books. Some of them frankly seemed dated and I couldn't get through them, though I really enjoyed re-reading Slaughterhouse-Five and Sirens. He certainly was a unique personality and a thought-provoking (and laugh-provoking) writer. 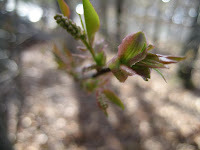 It's a beautiful spring day here in New England, but the signs of climate change are popping up all over the place. I'm in the middle of Robinson's Fifty Degrees Below and I am really enjoying the mix of interesting characters and real science (though admittedly not much in the action department). Climate is changing faster in this very-near-future novel than in real life, though not implausibly faster. A key idea is that of tipping points - when you reach one, things can change really fast (sort of like the chaotic orbits in Fly Me to the Moon). Some recurring characters in the book are from the fictional island nation of Khembalung, where Tibetan refugees have established a home on a river delta island in the Bay of Bengal. Barely at sea level to begin with, rapid climate change results in the complete flooding of the island, making refugees once again of the 12,000 Tibetans who had lived there. Khembalung is fictional, but there are real islands there, and they are sinking, as discussed in this article in today's New York Times. 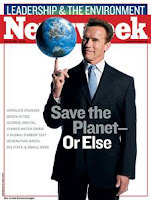 This week's Newsweek has a number of articles on the issues of climate change and leadership, which is clearly not coming from Washington, but fortunately is coming from California and other places. I forget which Terminator movie it's from, but one of Arnold's signature lines is "come with me if you want to live." Sounds like the start of a plan anyway! 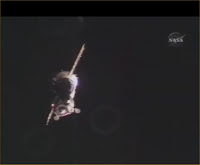 I took a little break to watch the last few minutes of the docking of the Soyuz spacecraft with the ISS on NASA TV at 11:10 pm Moscow time, above Ukraine. Pretty cool. 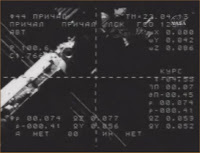 The black & white screen is the view from an engineering camera on the Soyuz at a range of 74 meters, closing at 0.4 meters/second (lower left data, just above the word HET, or nyet). 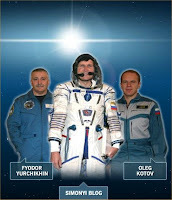 In just a few hours, the TMA-10 Soyuz spacecraft will dock with the International Space Station. Launched from Kazakhstan on Saturday, it carries two cosmonauts and the latest "space tourist," Charles Simonyi, a software designer who made his fortune developing applications for Microsoft. As was the case with Ms Anousheh Ansari last fall, Mr. Simonyi has been blogging about the preparations for his voyage, and he plans to send some blog posts from the ISS. He also has a rather flashy Flash-driven web site with a good bit of educational and multimedia content in addition to his blog. The "Kids Ask Charles" feature is pretty nice - there are answers to a lot of space related questions asked by kids all over the world. Once again it's good to see the effort being made to share this still rather rare experience with the people of the world via the web, though Mr. Simonyi's outreach efforts don't seem to have struck a chord with as many people as did Ms Ansari's, though his blog posts are certainly informative, detailed, and quite personal. SpaceAdvocate.com is the individual outreach arm of the Coalition for Space Exploration, whose members are companies, professional societies, and advocacy groups with a stake or interest in space exploration. While it's mostly focused on government-based space efforts such as the Vision for Space Exploration, the Coalition does include some private space companies (SpaceX, XCOR) . SpaceAdvocate.com has resources to help you keep track of key issues in Congress, to identify and contact your elected officials, and to explain the benefits of space exploration to others. Their three-page PDF handout highlights the various benefits of space exploration and includes the helpful reminder that NASA's budget is less than one percent (0.7%) of the total Federal budget. And as I like to point out, those NASA dollars are not actually spent "in space" - they are spent here on Earth, on jobs, technology, education, research, and preparation for the future, among other things. I can't think of many government programs that give us better value, except maybe the NSF. This video is also great, a four-minute musical/visual collage with Sagan's "pale blue dot" comments superimposed as text. Although physics is the "mind" of Orbiter, its 3D graphics would have to be its "heart." I have a whole Flickr site dedicated to Orbiter screen shots, and I even wrote a children's book based mainly on Orbiter screen shots, including various add-ons (Mars: Just Imagine, free 3 MB PDF). Other Orbiter users have galleries too (e.g., Darthvader, Kodiakspace, simcosmos, Andy, and I'm sure there are others on Flickr and elsewhere). Another manifestation of Orbiter as art is the forum screen shot contest, which pops up every few months (check out the current one). Many of these images are amazing, and some people use Photoshop to further enhance the realism or beauty of their basic Orbiter shots. I didn't enter the one I've posted here - it's just one I that I especially like from my Flickr gallery, using the amazing World of 2001 add-on (it's clipped a bit here - see the big version for the best impression of Orbiter's graphics). You should really look at the entries in the current contest - they are very cool. The major labels wanted to kill the single. Instead they killed the album. The Recording Industry Association of America wanted to kill Napster. Instead it killed the compact disc. Funky little record shops run by people who really knew and loved the music were certainly cool, but I have to admit that the current on-line environment suits me even better. I can easily find out anything I want to know, engage in on-line discussions, and buy even the most obscure music, new or used, electronic or physical. Even the funkiest CD shop or the biggest Tower Records would never carry anything as obscure as my own CD, which you can easily buy (along with millions of other "long tail" artists) from CD Baby, or download by the song at iTunes and other music sites. But it is too bad that the music industry didn't recognize the truth of "adapt or die." Actually they did recognize it, but they thought that "adapt" meant "hire more lawyers" rather than "figure out how to make money selling what your customers want." I just finished Forty Signs of Rain (2004), the first volume of Kim Stanley Robinson's latest trilogy, on the subjects of rapid climate change and how the processes of science and scientists work (or don't work, in some cases). I love the realistic feeling of this novel - from the fascinating bits of science to the characters to the workings of the NSF, a biotech startup, and a senator's office. Set in the very near future, this book rang true for me on every level. Of course it's also the setup for a gigantic disaster - very much like our current real life. I look forward to the next two volumes (the third was just recently published) and to perhaps meeting Mr. Robinson at ISDC in Dallas. I'm enough of a fan to bring along a book or two of his (Green Mars?) and to try to get an autograph. Interesting item via KurzweilAI.net and AP: China is developing a moon rover for a 2012 landing (I dug up the photo from a Chinese news site). It looks a lot like the NASA Mars rovers - a proven design! And although it has MER-like solar panels, primary power is said to be nuclear (presumably nuclear-thermal, like the power sources used on NASA's outer solar system probes). This would allow the rover to stay toasty warm and even to keep driving during the chilly two-week lunar night. I noticed this on the Bad Astronomy blog and it's really cool. Free and web-based Sky Map has a pretty basic interface (something like Google Maps), but it provides quick and intuitive access to a huge amount of useful astronomical object information, including direct access to the imagery from the Sloan Digital Sky Survey. I would still suggest that for off-line viewing and general "what's up now" purposes that you download and install the excellent and free program Stellarium (for Windows, Mac, and Linus), but Sky Map has deeper and wider connections to on-line astronomy resources.